Jan Adam Kruseman (1804–1862), Salome with the Head of John the Baptist (c 1861), oil on canvas, 120 x 90 cm, Rijksmuseum Amsterdam, Amsterdam. Wikimedia Commons. The great majority of paintings showing the story of Herod’s party, Salome’s dance, and the execution of Saint John the Baptist prior to the nineteenth century drew on the traditional account given in the gospels, in which it was Salome’s mother, Herodias, who was the villain of the piece. There are a few, though, which are less clearly committed. This article looks at some of those. Sebastiano del Piombo (c 1485-1547), Salome (The Daughter of Herodias) (1510), oil on wood, 54.9 x 44.5 cm, The National Gallery (Salting Bequest, 1910), London. Courtesy of the National Gallery, via Wikimedia Commons. Sebastiano del Piombo’s Salome, or The Daughter of Herodias, from 1510, is a surprisingly early painting to start exploring the role of Salome. 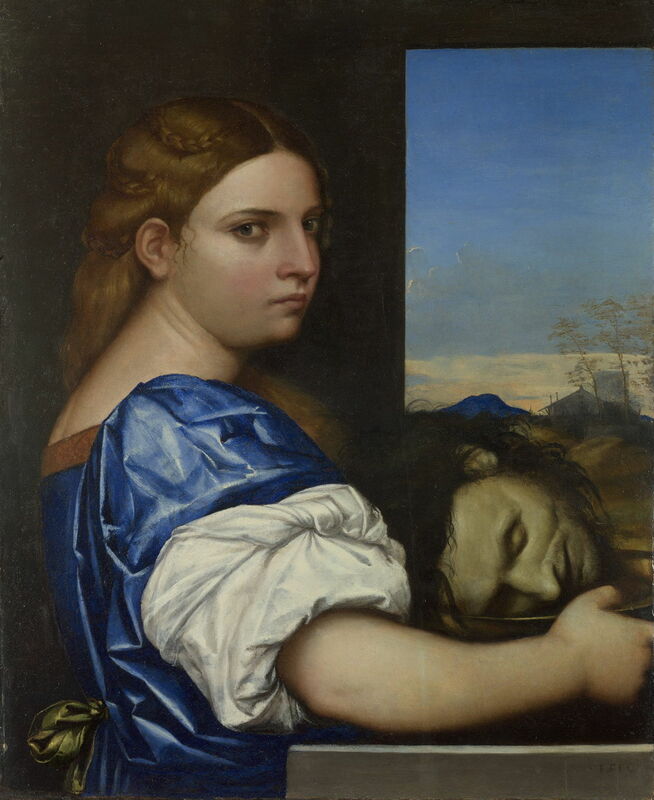 She is shown carrying John the Baptist’s head on a platter, but does not seem to be going anywhere in particular with it, and her facial expression raises questions about what she is doing. Although relatively neutral, her face has a certain hardness about it. She is modestly dressed, and looks directly at the viewer, not at John’s head, whose eyes are closed in any case. Lucas Cranach the Elder (1472–1553), Salome with the Head of Saint John the Baptist (c 1530), oil on poplar wood, 87 x 58 cm, Szépművészeti Múzeum, Budapest, Hungary. Wikimedia Commons. 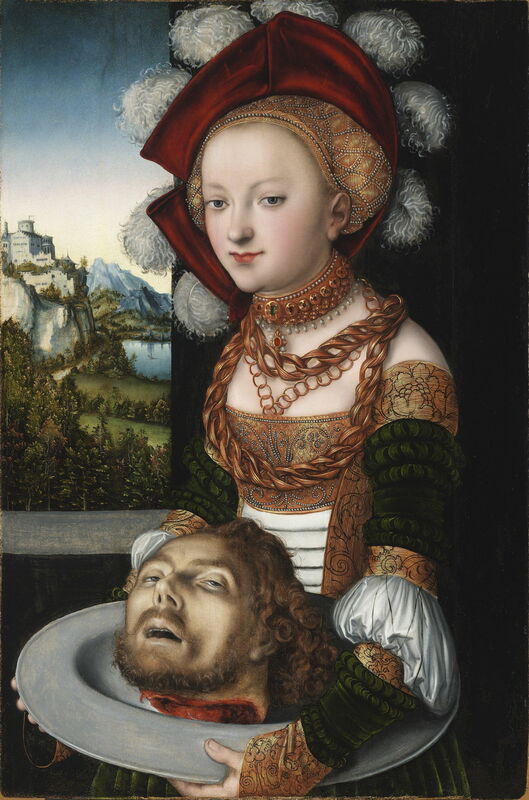 Lucas Cranach the Elder’s Salome with the Head of Saint John the Baptist from about 1530 is another ambiguous portrait of Salome bearing John’s head on a platter. This is a woman dressed in all her finery, with a slight sneer and smile which hardly fit the gravity of the situation. Again, she is not looking at John’s head, and his eyes are only partially open, and not looking at her. Leonaert Bramer (1596–1674), Salome Receiving the Head of Saint John the Baptist (c 1635-40), oil on canvas, dimensions not known, Musée des Beaux-Arts, Nîmes, France. Image by Caroline Léna Becker, via Wikimedia Commons. 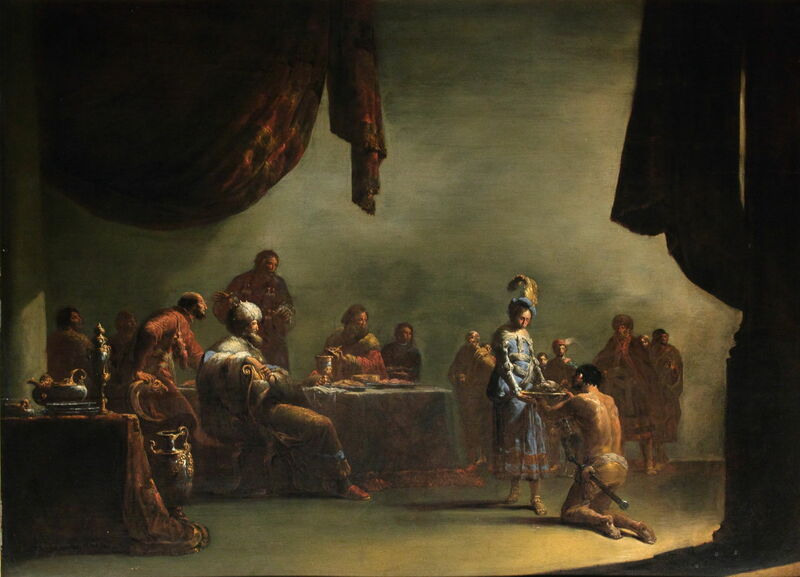 The other early painting which could raise doubt in the viewer’s mind is Leonaert Bramer’s Salome Receiving the Head of Saint John the Baptist (c 1635-40). Salome is just being presented with the platter bearing John’s head, and, true to the biblical account, is still at Herod’s birthday party. Although there is no requirement for Herodias to be present, there is no sign of her in the painting. For her part, Salome does not appear taken aback as she looks down at John’s head. Paul Delaroche (1797–1856), Herodias (1843), oil on canvas, 129 x 98 cm, Wallraf-Richartz-Museum, Cologne, Germany. Wikimedia Commons. 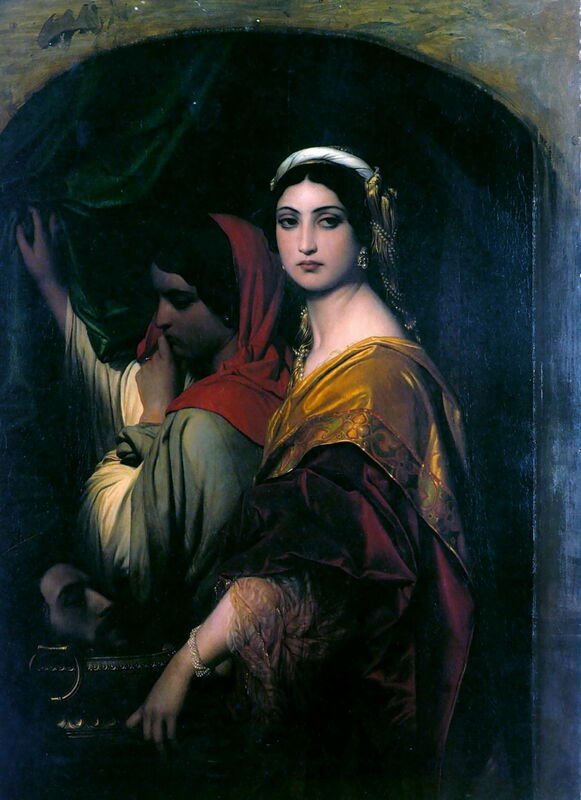 If the title is that given by the artist, Paul Delaroche’s Herodias (1843) should be read entirely in accordance with the biblical story, as the nearer woman – despite her relative youth – must be Herodias, and the younger woman in the shadows would be Salome. 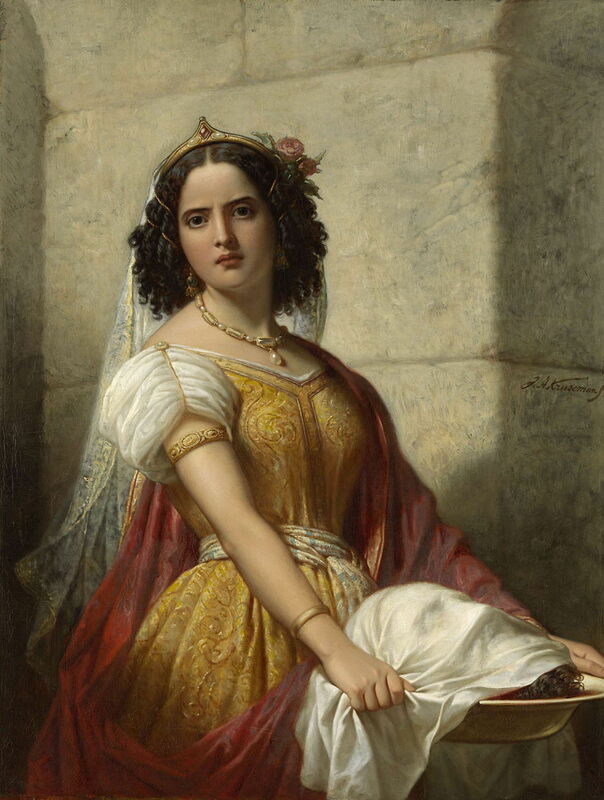 Perhaps Delaroche is the more accurate, if Salome was still in her teens at the time, but traditional accounts (as seen in the previous article) make Herodias considerably older in appearance. Pierre Puvis de Chavannes (1824–1898), The beheading of John the Baptist (The Daughter of Herodias Gives the Signal for the Ordeal of Saint John the Baptist) (1856), oil on panel, 140 × 89.5 cm, Museum Boijmans Van Beuningen, Rotterdam, The Netherlands. Wikimedia Commons. Pierre Puvis de Chavannes painted two different versions of The beheading of John the Baptist. This is the earlier, from 1856, alternatively known as The Daughter of Herodias Gives the Signal for the Ordeal of Saint John the Baptist, which in itself raises questions. 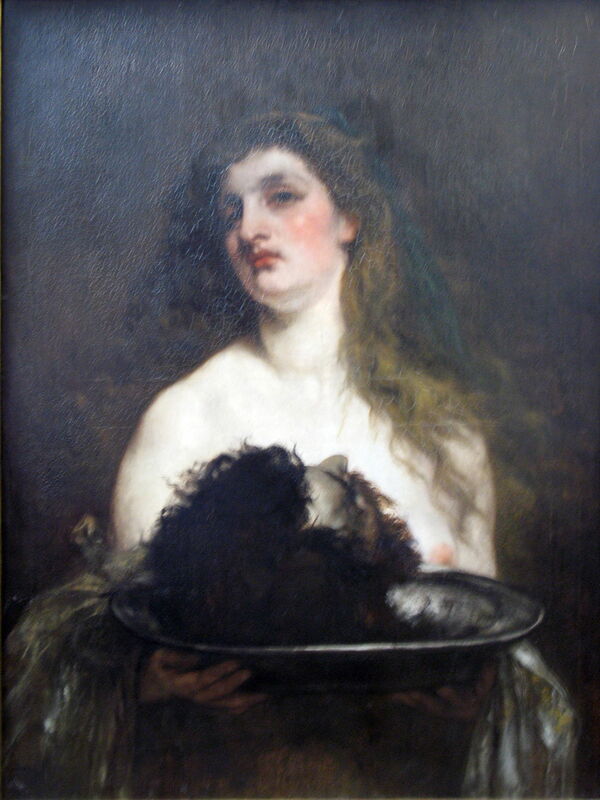 Salome dominates the painting, her right hand holding the empty platter high above her head as she is about to drop it to signal John’s execution. John the Baptist is still alive at this stage, seen in the murky distance at the left. Another figure, perhaps Herodias, is hiding in Salome’s robe, behind her. His later painting, from about 1869 and in the National Gallery in London with a smaller version in Birmingham, is more in accord with the biblical account. Reading the facial expression of Jan Adam Kruseman’s Salome with the Head of John the Baptist (c 1861) is also crucial to his intended narrative. Salome’s brows are knitted, her face almost scowling at the viewer, and John’s face is discreetly covered with a white cloth. Victor Müller (1829–1871), Salome with the Head of John (1870), oil, dimensions not known, Alte Nationalgalerie, Berlin. Wikimedia Commons. Victor Müller’s Salome with the Head of John (1870) (I apologise for the blurred image) also rests on the interpretation of her facial expression. Salome’s face is flushed, with anger, distress, or other emotion, and her head is tilted back. 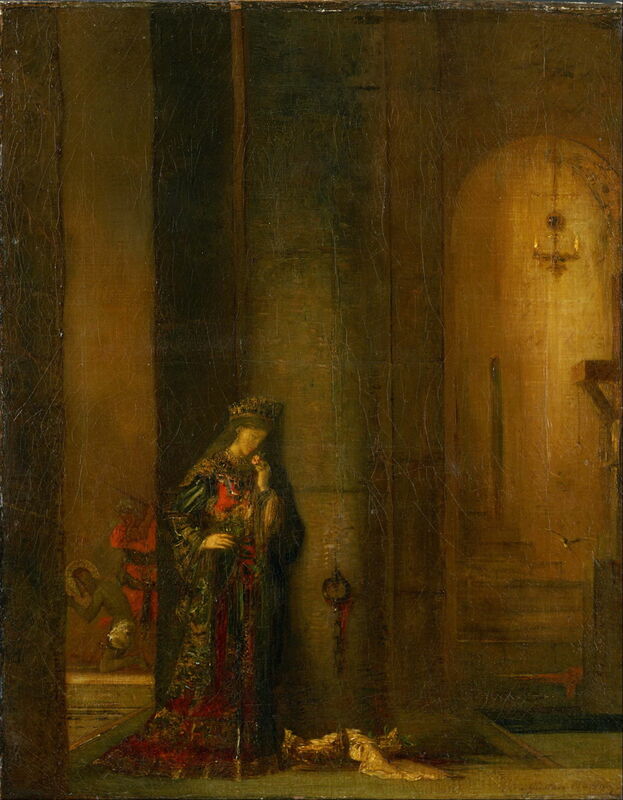 More ambiguous still is Gustave Moreau’s Salome at the Prison (c 1873-76), another of the series of paintings which he made when he was working on The Apparition (1876). 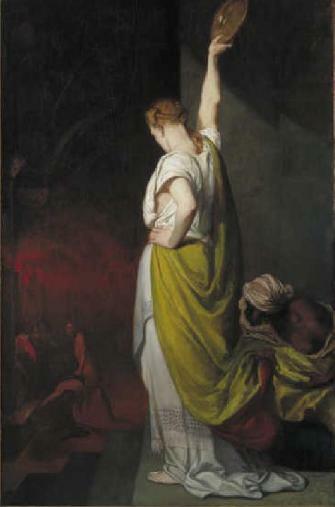 Salome stands pensive in the foreground as the executioner’s sword is about to behead John at the far left. 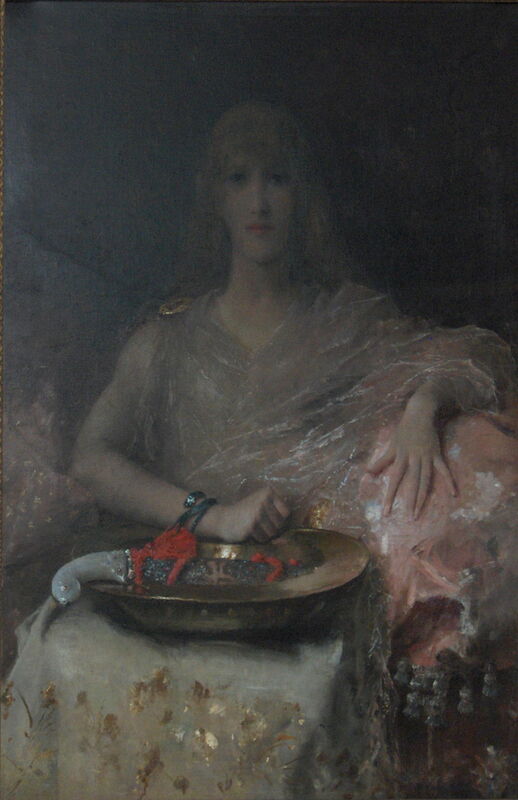 Alfred Stevens (1823–1906), Salome (1888), oil, dimensions not known, Koninklijke Musea voor Schone Kunsten van België, Brussels. Wikimedia Commons. Alfred Stevens’ Salome from 1888 shows a new theme which developed in the late nineteenth century, in which Salome is shown with the executioner’s knife and her platter, before the execution takes place. She has assumed much greater involvement in the beheading: it is no longer the executioner who is sent by Herod to perform the task, but Salome who is in charge. The next and final article will consider those paintings and literature which unambiguously put Salome at the centre of the story. Posted in General, Language, Painting and tagged Bramer, Cranach, del Piombo, Delaroche, Kruseman, Müller, Moreau, narrative, painting, Puvis de Chavannes, Salome, Stevens. Bookmark the permalink.